Concrete Trespass – This is an increasingly common occurrence and can result in months if not years of contentious negotiation for the concrete incursion to be first assessed, then removed whilst the costs are determined, their liability assessed and eventually paid for by the party responsible for them. Concrete removal costs can run from thousands to many hundreds of thousands of pounds as the works is specialised and has to be done with due care and attention given that by the time it has been exposed at least one basement already exists and doubtless someone will be living in it. The work is expensive also as it has to be done when it is discovered and this inevitably occurs when excavations start on the development site. This discovery can cause delays to other contract works causing contractual claims for the contractor’s loss of profits etc. as well as associated/consequential losses to accrue i.e. delayed cost of a sale or missed rental income. (NOTE FROM WRITER – as a Chartered Surveyor practising in this area currently I would assess that this issue takes up around 50% of my time). This trend is set to continue since the increase in the number of basement projects over the last 15 years means there are now more new basements being built against existing ones and in so doing making use of the walls/underpinning that has already been formed by the neighbours. In theory your neighbours existing adjacent basements can be good news if the basements walls have been properly formed and are prepared ready to be made use of. Their existence should speed the construction of your own basement and subject to an apportionment of costs – which the Party Wall Act facilitates under s11(11) – you now pay only a proportion of the cost (generally 50%) your neighbour would presently pay when solely responsible for the cost. This is not so good if the wall has been poorly formed and concrete has escaped onto the neighbours land. Concrete can trespass/escape for many reasons; poor design and setting out by the engineers; ditto and poor workmanship by the contractor; difficult or unexpected ground conditions; cost cutting or pressures of time under the contract or any combination of these factors. It is foolhardy to assume every basement project will be the same, no two contractors or developers are the same, just as not every site has the homogenous stiff clay soils which are considered ideal for basement excavations without any ground water issues to complicate proceedings. Ground water apart generally the biggest site problems arise when soft pockets of granular soil are encountered since these flow as they are not self-supporting like clay soils. Ordinarily excavations in softer soils should be shuttered (lined with supporting sheets) but the ground can break away unexpectedly and it then needs to be backfilled – probably with concrete. If this backfilling is placed on the neighbours land then it is in effect a trespass, albeit possibly a benign one used to stop the land subsiding or otherwise continuing to fall away. When backfilling is needed of the soil on the neighbours land conflict can arise if the necessary consents are not obtained. The client, contractor and contract administrator need to carefully record what agreements arise and what instructions are given to avoid any misunderstandings on liabilities in the future. No party will be immune from cost in dealing with the issue of trespass. Initially it will prove extremely expensive and disruptive for the erstwhile developer who will inevitably have to pay out to resolve the problems before an recovery of costs can begin. It will also be very harrowing for the original developer and its design team who will doubtless see the claim rumbling with increasing menace in their direction. I can also add that it is just as stressful for the surveyors who try to pick their way through the minefield of vested interests, and unhelpful responses from Insurers and others who see only pain and no gain through your involvement. From the surveyors perspective the starting point is to determine who should be dealing with the overspill a) the newly appointed surveyors whose works are now affected by the concrete incursion, or b) the originally appointed surveyors whose works caused the recently discovered incursion. This will depend on what works were carried out and when. 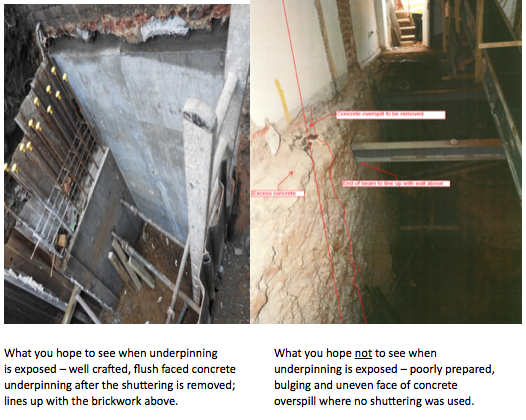 Mass concrete and reinforced concrete can be dealt with differently as can recent and historic basement works. If the current developer is lucky the party who carried out the previous basement installation will be easy to find. If the works were not recent and carried out by a now defunct or impossible to contact party i.e. overseas property Investment Company, the quest will be many times harder or worst. Proceedings having started the surveyors will ensure the net is cast wide to involve anyone seemingly stained with a tinge of liability; then the fingers will start to point and the fun and games will start. Some consultants, contractors and insurers will be genuinely concerned and helpful in the determination of liability. Needless to say others will be less forthcoming. This is almost understandable when it comes to consultants, contractors and doubtless their sub-contractors all to different degrees involved in the basement construction as they do not wish this to reflect poorly on their services. It is less understandable when it comes to insurers who presented their business credentials for such eventualities only to excuse their assistance by bringing to the fore previously hard to find caveats in their policies. It probably makes sense for me to leave out my further thoughts on Insurers but it may come as a surprise to affected parties to find out that the existence of both negligent and non-negligent insurance policies is no guarantee that a claim will not fall between these two. As costs for damage and rectification begin to bite, and without the involvement of insurers then it becomes the turn of litigation experts. Their conduct will make the surveyors seem courteous, lightly benign and definitely cheaper! A statement of claim is made to take any ambiguity out of the issue of responsibility. This will then be countered and the proceedings will lead inevitably to court or more probably an out of court settlement. Whatever the outcome neighbourly relations will have been truly tested. 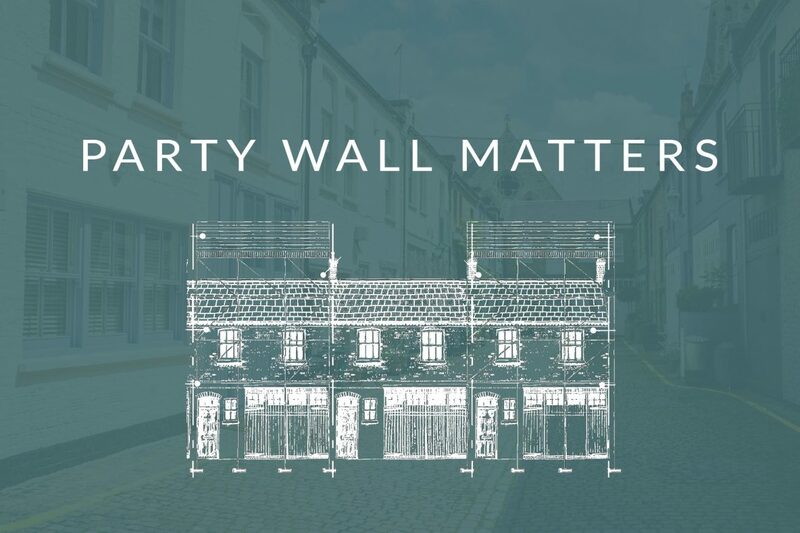 This post and the others in this series in no way attempt to provide specific advice on specific party walls issues relating to any particular mews property. Being general in nature it is no substitute for any professional advice you will need with your own Mews property. If you are unsure whether you need to issue a Notice please contact us. We will then be happy to advise you further. Additionally, and for more information on the legislation please refer to the Government’s Explanatory Booklet.